Hey. You. I’m going to tell how the sausage is made. Let’s look at any 7th Sea sourcebook. Read through all 208 pages of that thing, every chapter, every sidebar, and yes, even the fiction in the front. See how well that thing flows? See how well that runs together? It’s like there’s one voice telling you all about this bit of the setting and explaining these rules to you, right? Now look at the credits. You’ll see a Lead Developer credit, probably four “written by” names, and up to eight “additional writing by” names.1 All these people, with all these different styles of writing, have their words blended together — and sometimes rearranged from one part of the book to another — thanks to the editing team. The lead developer on the book comes up with an outline and overview for the book, parcels that out to her writers who, using a style guide for the line, write their own separate sections. Words come back and go through a development editing process (parts of which are still in a magical black box from my perspective), where passages are reshaped, the voice of the writings are moved more inline with the rest of the book, and so on. Rewrites happen, revisions, and then a run through proofing. Then all the words go to layout. At that point, all the different authors’ sections should feel the same. There shouldn’t be anything jarring like suddenly we switch to second-person point of view in chapter three or have “the player” in chapter one and “he or she” in chapter five and “they” in chapter seven all referring to the same person/role. So if you have a book where there’s great writing, chances are it’s because that book had a great dev editor. To the question, which RPG features the best writing, there are many ways I can look at that question. Clean, clear, concise writing? Entertaining writing? Writing that inspires? Writing that communicates an innovation in gaming? I’ll tell you about Buffy, the Vampire Slayer. It’s written in a way that echoes the IP it is based on so well. The tone of voice, the grammar and slang, the delivery — the writing in Buffy is simply the best translation of an existing product to a roleplaying game I have ever seen, convincingly setting the game in the head space the original property resides. It’s masterfully done. Last year, we ran out of time and didn’t finish the last part of #RPGaDAY 2016, which was okay because the questions were kind of lame. For instance, the question for the 19th was “Best way to learn a new game?” which, when it comes to roleplaying games, the answer is really “read it, then sit down to play”. Other questions I replaced from 2016’s listings were “What fictional character would best fit in your group?” which hints at how the guy coming up with questions assumes everyone else plays games with just one group and “Largest in-game surprise you have experienced?” which ventures too far into the “tell me about your character” field. In 2015, the topic was “Favorite Superhero RPG”. This year, it’s Masks: The New Generation. 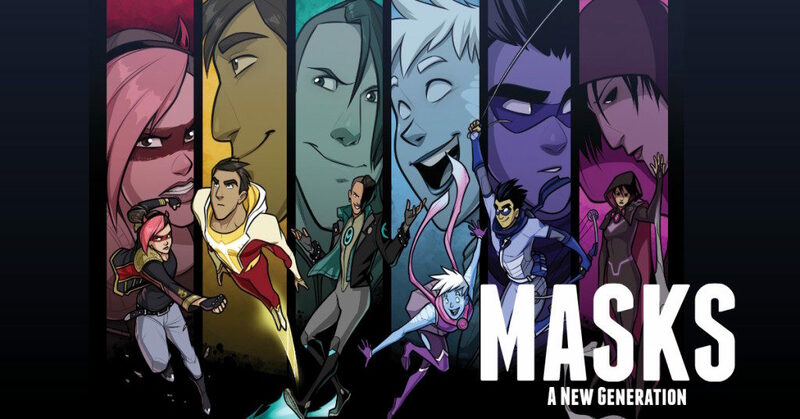 It’s basically Young Justice, the RPG. A PbtA game, how could I not love it? Also at Gen Con, I was able to sit in a demo of Sentinel Comics RPG and was impressed with the system. I’d like to see that when it comes out. In 2014, the topic was “Favorite Published Adventure”, which really hasn’t changed much. When I revisited the question two years ago, I went to Princes of the Apocalypse, but I’ve played that since then. There are some…issues I’ve been having with it, logical ones such as “if the doors in this entire area are only three feet wide, why are there five large-sized creatures in this one room?” and things were the design team didn’t really consider how creative the players could be in pretty much circumventing whole sections of the game, like how when a group might be in the water temple, they’d all probably have a cleric that can cast the Water Walk spell. It’s like the Against the Giants 5e update where you can’t burn down the hill giants’ wooden fortress because of recent heavy rains, but the inside of that place wouldn’t be soaked through.